Optimized for 8K & 4K cinema-quality video capture in the latest DSLRs and camcorders, the Delkin Devices Prime 1900X UHS-II (U3/V60) SD memory card supports advanced modes that require a memory card to record & store multiple files simultaneously, such as RAW + JPEG, multiple video streams created by 360º cameras, video + still + GPS data & time-lapse. 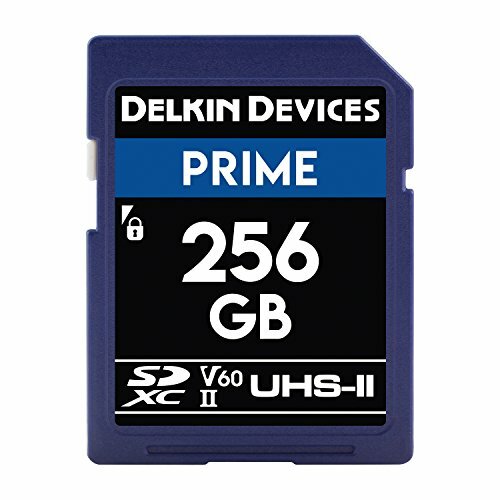 The Prime SD card utilizes the latest speed class technology, Video Speed Class 60 (V60), while boasting recording speeds reaching up to 100MB/s to ensure that data is written swiftly and safely to the card. It is also approved for continuous-burst shooting; capture rapid-fire RAW shots without delay. Capable of offloading data at speeds reaching up to 300MB/s, the Prime SD card ensures the quickest, most efficient data transfer from card to computer for immediate access to your files and sooner post-production start time. Built to endure even the most strenuous shooting environments, the Prime SD card is durably designed to be waterproof, shockproof and X-ray proof. In addition, the card also utilizes built-in error-correction and wear-leveling to ensure data integrity and a long lifespan. Each card is furthermore backed by a Lifetime Warranty and Delkin’s American-based customer support team out of San Diego, CA. If you have any questions about this product by Delkin, contact us by completing and submitting the form below. If you are looking for a specif part number, please include it with your message.